These are two coincidences about 9/11 that you may have heard previously - though I hadn't myself. They are to do with music album covers. 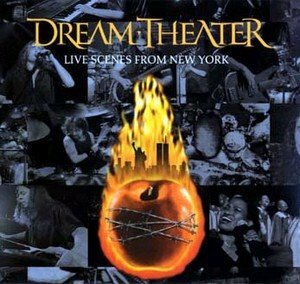 The first (as above) shows Dream Theater's original cover for their album 'Live Scenes From New York'. This was released on September 11th 2001. As can be seen this shows the World Trade Center in New York burning. The cover was quickly recalled and new art work provided. But there was another similar example as well. This time it was the Coup and their album 'Party Music', as shown below, again from 2001. The cover appeared to show a group member detonating explosives at the World Trade Center, with the buildings showing smoke and flames. The art work was again quickly replaced. Coincidences? Or maybe the designers unknowingly latching on to powerful currents of thoughts and ideas being generated by ... well, whoever was responsible for 9/11. how strange is that specially the first one released on the same day as 9-11. I hadn't heard of either of these. It IS strange that the first one was released on 9-11. Two great instances of how creativity taps into the future. Very strange indeed! Coincidence? I think not. No such thing. I agree that we are very powerful energy systems and in some way those involved in depicting such art tapped into something! The first pic shows a burning apple (the big apple?) and the skyline in the back. Had they attacked anything in Manhattan the could have said the same. Given the fact that there are millions of creative people in some way inspired bij NY it is hardly surprising that almost every day somewhere in the world there will some art piece with these ingredients. The second is more accurate, but also not entirely given the iconical status of the Twin Towers, the earlier attacks and in general, the destructive tendencies against symbols of power by sub-cultures. I say hey, welcome in a world in which our minds are controlled not by illuminati or such, but by a monolithic visual culture in which people produce ever more cliches.